Hello. I went to the local gunshow today hoping to find maybe a clean M64 or M10. I saw no examples of the first and only one of the second, though there were quite a few makers' revolvers present. I looked at one obviously used S&W Model 66 and while it had a nice action, the price was too high and I believe part of the "nice action" included a cut down strain screw. I passed on the gun. I kept telling myself as I checked each aisle, "Here's where I'll find a new Model 10 HB or maybe even a new NYSP Model 520 and at the right price." That didn't happen but I did run into a friend of mine that I hadn't seen in years. He had a brand new, unfired Model 66 21/2" snub he'd never fired. The regular S&W service stocks were not on the gun; it had a set of checkered boot grips instead. The action was nice but full-powered and there was absolutely no end shake that I could find and the timing was positive with but a tiny amount of lateral play in the cylinder; no blemishes a tall on this one so I coughed up the money. All in all, I'm pleased with this purchase. I'll shoot this one enough to "be sure" and then it will probably be loaded with a mid-power .357 load for around the house. Driving home I remember those days so long ago when I would go to Mr. Pierce's gun shop and look around at what used handguns had come in that week! I remember moving all those darned ol' Model 58's out of the way to check out this or that, or deciding, "No, it's a good price on that Model 27 but I already have two 3 1/2" guns and a couple of the 5" ones, too. I won't buy it." Man, if I could only go back, even for just one day. I remember passing on more than a few really nice Model 10's that were slick as the proverbial gut from the factory and priced nice. "Naw, I'll wait. You can always get Model 10's like these." 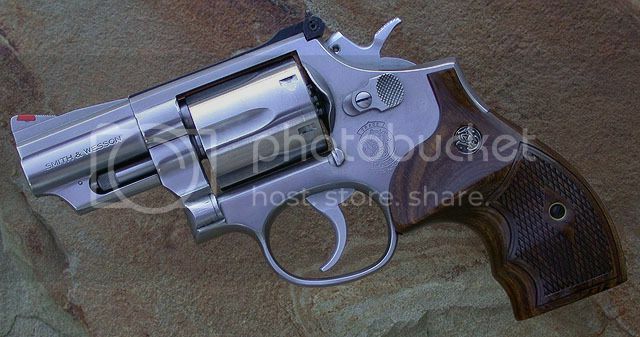 Anyway, I am pleased with this Model 66-2. Unpinned and not recessed is about as "new" as I care to get with S&W's. That's a beautiful find, Mr. Camp. I like the grips on it as well. I understand you're search for a M10, I found a 4" pencil barrell last year at a fair-enough price and have been searching for a 2" M10 for the longest. Seems like those that have a 2" dont' want to let go of them!